On a barren expanse of unrelenting, stark landscape, the desert comes to life. Sprouting from a sea of dunes, the Desert Blooms bring life, movement and colour in a joyous celebration of nature and her myriad possibilities. The giant Flowers gently follow the path of the sun, and settle down over the dunes for the night. The dunes shelter people and their activities, many of which help tend the Farm of Flowers and keep it thriving. The Desert Blooms are a playground for a child, a garden for the city, and a source of useful energy for atleast 15000 homes across the country. As the Flowers follow the sun across the sky, they reaffirm Man’s place as part of the interconnected web of Nature, and gesture towards his duty and responsibility to live in harmony with Her. The primary component of the Desert Blooms is a single Flower, that is a gas filled balloon that works as a solar concentrator device. Solar Concentrators in general, are heavy, ground mounted, mirror based systems that require to be situated on vast tracts of open, uninhabited lands (see Appendix 1). 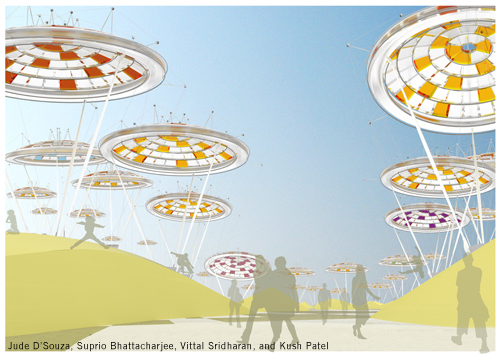 The Flower is based on a design of a solar concentrator that is light weight and non – disruptive, does not occupy much ground space, is low cost and modular. Built of gas filled polymer cells mounted onto a lightweight metallic frame, the lower surface of the cells is provided with an assymetric prismatic pattern to focus all incident radiation onto a solar receiver below (see Appendix 2 in conjunction with Sheet 3 for Working). The balloon is tethered down and braced against wind pressure by cables and a central trio of pylons that also help maintain a fixed aspect between the balloon and the solar receiver at the base at all times. The same cables are controlled in length at the base to provide for solar tracking across the day, and across seasons. The balloons therefore move across the sky through the day, and a motorist driving by in the evening would see a totally different alignment of balloons from what s/he would have seen in the morning. While the balloons do not need any particular form of base so long as it is rigid, the Desert Blooms develop on the idea of a base to its advantage. The Land Art Generator Project is seen as one that stimulates and draws people’s engagement as involved participants in the work, and not as passive spectators. The Dunescape at the base of the Flowers recalls the creations of the wind in the deserts deeper inland, and many are earth sheltered enclosures, containing within them places for people to inhabit temporarily in their experience of the Desert Blooms. The main energy required to run the complex is for the solar tracking by the balloons. Much of this energy is contributed by people exercising and playing within the dunes on machines that tap their energy to power the movement mechanisms of the Desert Blooms. The Art / Energy project is thus brought around full circle, with its beneficiaries also acting as its caretakers! In the evenings, as the sun sets, the Flowers drop down over the dunes, and through a low energy lighting system, breathe light through the night, keeping the place alive for various cultural and social events to take place within and among the dunes. Thus, the Desert Blooms art / generator project attempts to be more than an object for mere viewing, rather becoming a place for people to engage more fully with the installation. The Dunescape is an inhabited terrain, protected from the harsher aspects of the desert climate by its earth covering. Within the dunes are primarily three functions – the control functions and administrative facilities for the Desert Blooms site, ‘human energy’ zones, and the ’seed farms’. Human Energy zones are gymnasiums and play facilities that visitors and regulars can take part in, their expended energy being captured to meet the ancillary energy needs of the Desert Blooms facility itself (see Appendix 3 for Energy Generation Calculations).